The white truffle is perhaps one of the most fabled, lavish ingredients in Italian cookery. Fall is truffle season in the town of Alba, in Piemonte, Italy. For those of us in this country lucky enough to live near an importer of fresh truffles, we can get a taste of those very truffles. I made this dish in honor of and under the direction of my neighbor, Beppi. For those of you who havcen’t read my “About” page, Beppi is the former owner of a highly acclaimed Italian restaurant, “San Marco,” in New York from the sixties through 1990. Named after the square in Venice, it featured the cuisine of the Veneto region, and was one of the forerunners of regional Italian restaurants in New York. The cooking of the Veneto is elegant and refined, light on the garlic and red sauce; heavy on the wine and butter. Every year at this time, San Marco featured a pasta dish that was so lavish that its $16 price tag eclipsed all the other dishes on its already expensive menu, with pasta dishes averaging $3. Craig Claiborne of the New York Times wrote, in his three-star review, that “San Marco was the most expensive Italian restaurant in the country–but worth it.” Recounting this always puts a broad, proud smile on Beppi’s face. 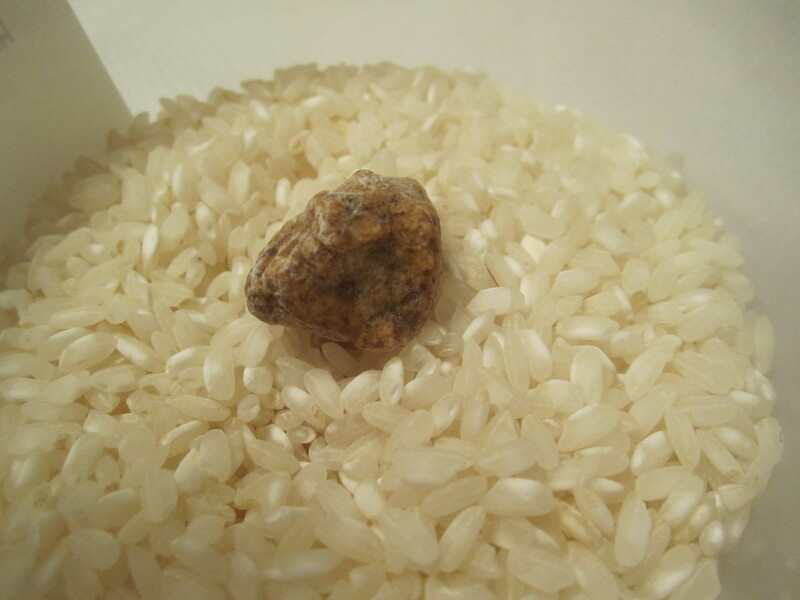 It’s been years since I’ve bought a white truffle, and this year, on Beppi’s 90th birthday, I promised him I’d find a fresh white truffle if he’d teach me to make the pasta dish from the San Marco menu. I went to my local branch of the NYC gourmet market, Citarella, suspecting that if anyone on the east end of Long Island would have a white truffle, they would. I was thrilled to find 2 tiny, fresh truffles in the appetizer section behind the glass. They are stored in rice (which becomes scented by them) and sold by the ounce. I’m not even sure of the price per ounce, but each of the 2 quarter-sized orbs was $56. I breathed in their fragrance and instantly bought them, knowing how happy the sight and scent of them would make Beppi. Besides, what better thing to do on a stormy, prematurely cold October Saturday afternoon? From his utensil drawer, Beppi pulled a cherished implement–a truffle slicer given to him by Enrico Caruso’s personal assistant, who was very old at the time of the gift. Since Caruso died in the 1920s, this slicer had been used to shave truffles over Caruso’s pasta before Beppi had even been born. He gave the truffle slicer to Beppi as a keepsake, and Beppi hadn’t used it in many years. We eagerly brought it to my kitchen, along with the ingredients to the pasta. 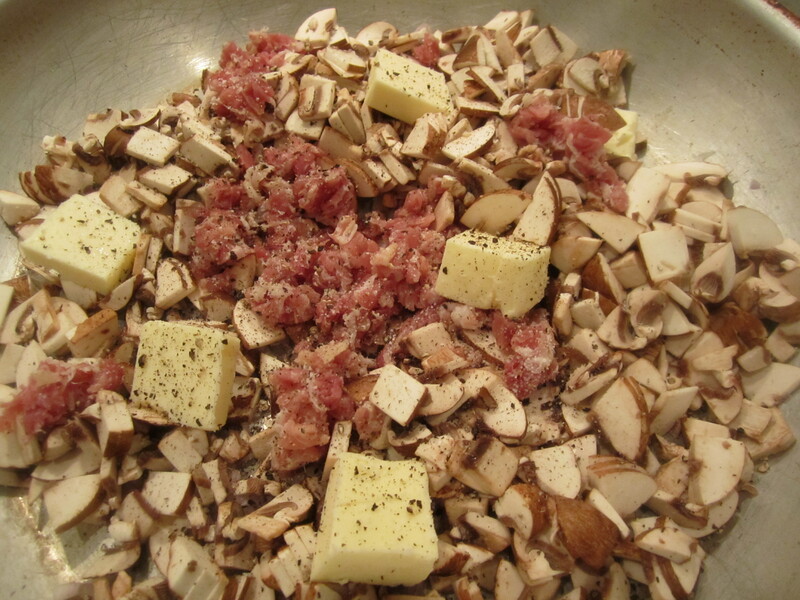 Besides truffle, there is prosciutto, shallots, mushrooms, butter and stock, plus plenty of parmigiano for sprinkling at the table. 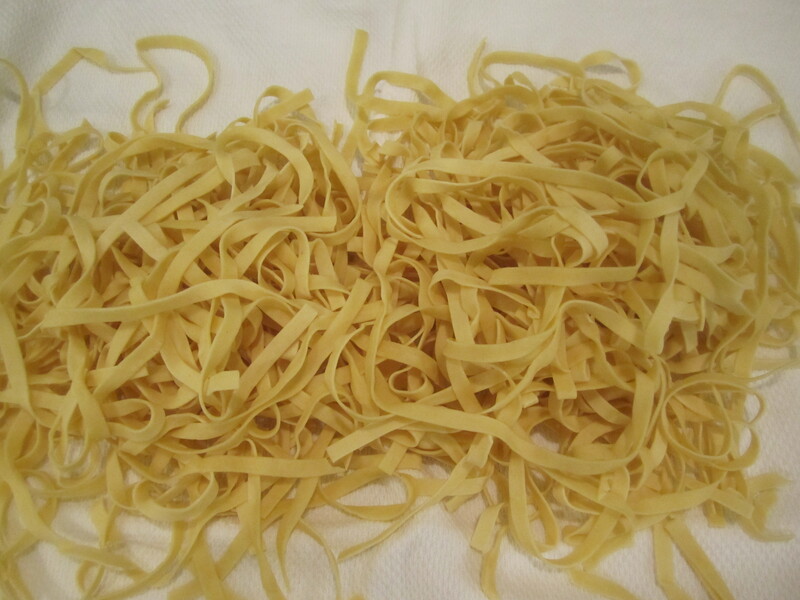 The pasta should be fresh egg fettucine. The mushrooms and prosciutto get chopped very thinly and finely and sauteed, resulting in a wonderfully salty, earthy undertone. The thin wisps of white truffle shaved on at the end simply take the earthiness to new heights. Without further ado, here’s the dish. 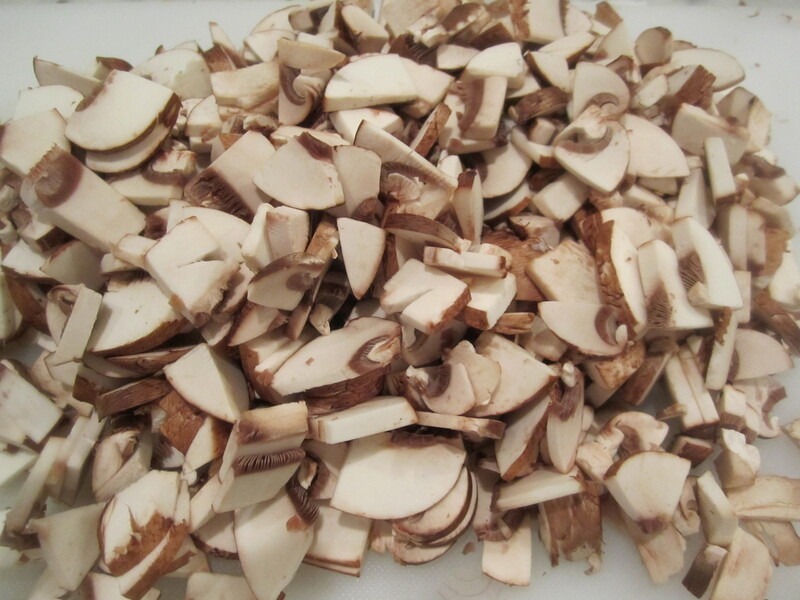 Slice each mushroom in half, or thirds if it is large, and slice each half into thin little shavings. 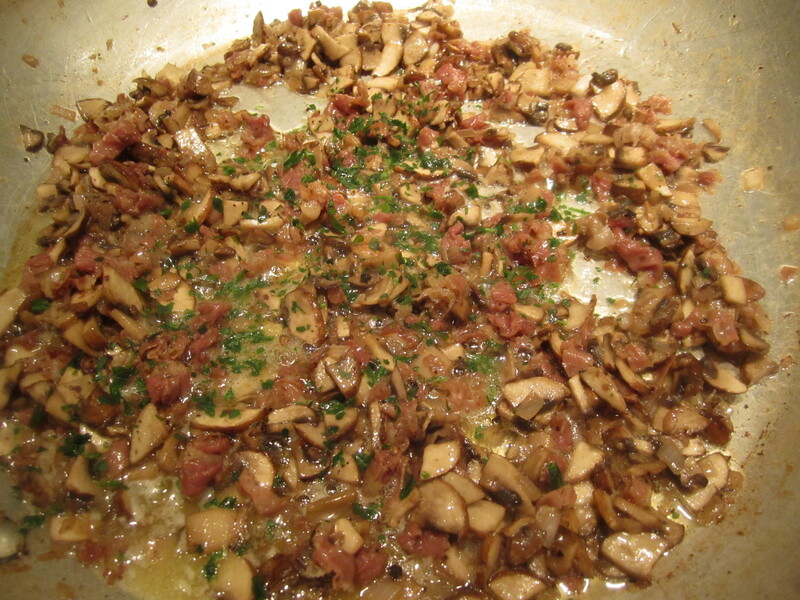 Place mushrooms, prosciutto, shallot and butter in a large skillet, along with a 1/2 teaspoon of salt and pepper. Turn heat to high and saute until mushrooms shrink and begin to turn golden (about 7 minutes, depending on the strength of your burner). Add parsley and taste for salt and pepper–it should be nice and salty. 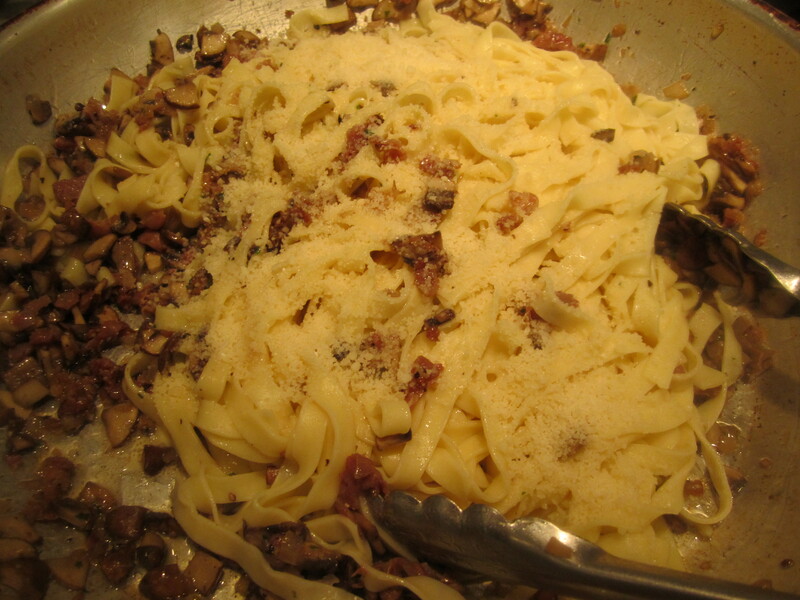 Toss the cooked pasta into the skillet with the sauce and add the broth, along with 1/4 cup of grated parmigiano cheese. Toss well to combine. 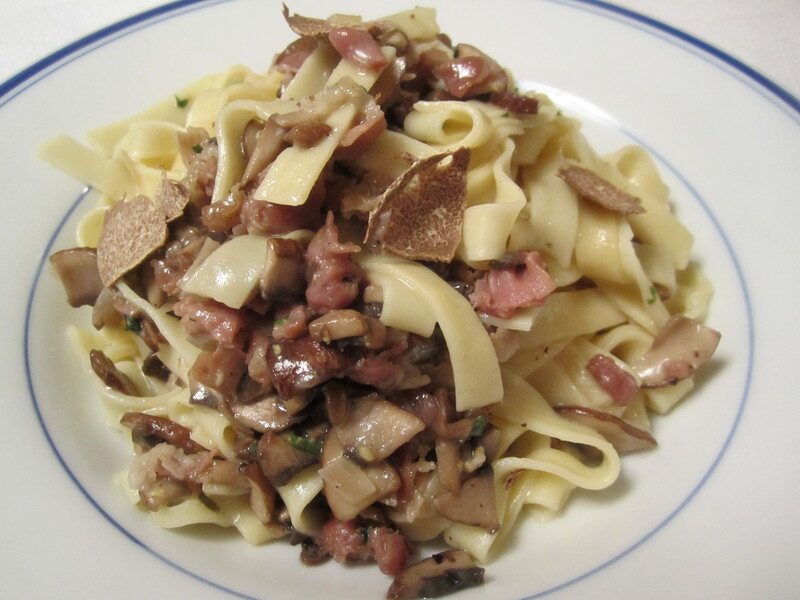 Place a pile of pasta in each heated pasta bowl and top with shavings of white truffle (use a vegetable peeler if you don’t have a storied truffle shaver). Serve immediately!